Learning Painting and Sculpting Artist Dolls and Figurative Pendants … and Other Arts. Copyrighted, All Rights Reserved. This page is not designed to cover all tips, techniques, needles sizes and such and cannot take the place of Kraft-tex books, videos, workshops, or project downloads. I show and discuss using an array of common art products on Kraft-tex, link to an ever-growing Pinterest board loaded with examples, include basic tips, and illuminate some basic starter information. That’s it. Kraft-tex is a durable cloth-paper hybrid product and how you prepare it before using it can make a huge difference, something evident on my Kraft-tex Pinterest board. Right off the roll or bolt, it’s heavier than 140 lb. watercolor paper or cardstock but it doesn’t feel exactly like really heavyweight paper either. It’s a hybrid product initially created as a synthetic leather substitute, doesn’t need interfacing and basically you have two choices — make it supple like fabric/leather or keep it stiffer like really thick art paper. The difference begins in preparation. Washing it makes it feel more like supple leather…more on that process in a moment. If you want to keep it paper-like, stiff, and flat, it can be ironed even on the highest setting. Some examples of projects that use flat unwashed Kraft-tex are folders, book covers, or envelopes. Also, using Kraft-tex with various templates meant for cardboard gift boxes, etc., is not an unknown. There are many free templates for this on the Internet. Tip: Watch Out for Lint, Be Careful of What You’re Wearing — Often, artists don’t realize that their clothes shed fibers until they’re working in the studio. 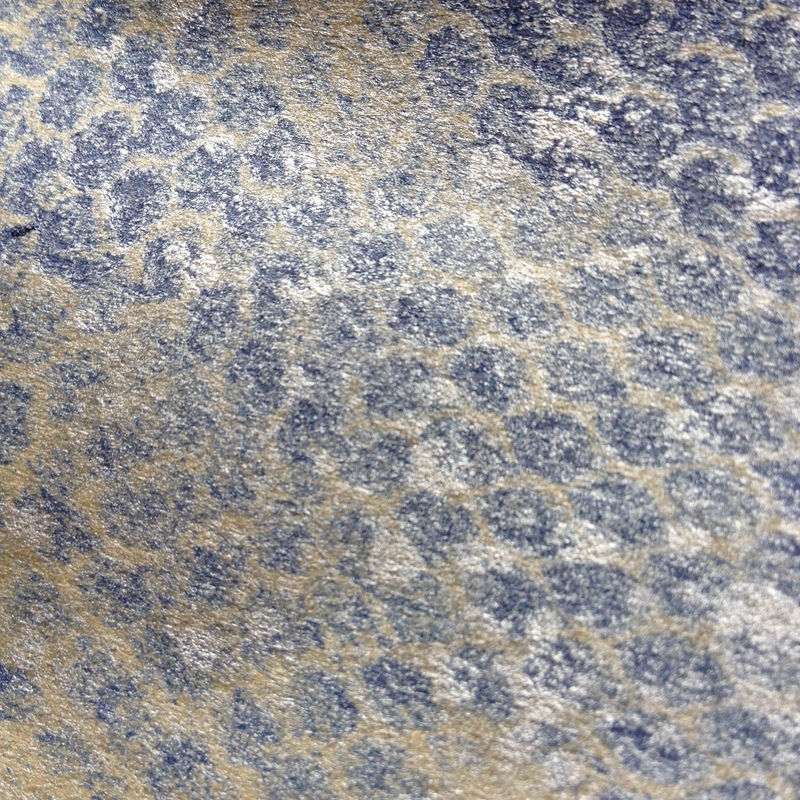 For example, wearing my fluffy navy blue bathrobe while working on white Kraft-tex left it covered with dark fibers. Tip: All needles and Kraft-tex are permanent. all needle holes are permanent on Kraft-tex. This will affect what size needles you choose, how you backstitch, how you double stitch, and stitch length. Choose a longer sitch length than usual. You may use hand sewing needles, embroidery needles, or an 80/12 sharp sewing machine needle. You will not pin your pattern pieces together before sewing, for obvious reasons, you may have to clip them in places instead. One can also play with decorative perforation. Tip: Needle sizes and scissor sharpening? Use a hand, sewing machine, or embroidery needle that’s strong enough but no larger. Also, Kraft-tex dulls scissors and sewing machine needles more rapidly so sharpen your scissors frequently enough and replace sewing machine needles if they get too dull. If you really get into Kraft-tex, you may want to use dedicated sewing machine needles (meaning you don’t use those needles for other stuff). Tip: Do decorative stitching before you sew your project. Tip: One can dye it an array of colors using Rit dye. Tip: Cut our pattern pieces before pre-washing, if you’re pre-washing your Kraft-tex. Tip: To fold, lightly score and then fold with the bone folder. This will make sure it folds along the intended line nice and neat instead of creasing and creating an imprecise messy fold. You can see the process here. To score, lightly draw the “blade” edge of a bone folder down along the intended line, then fold by running the flat side of your bone folder along the intended folding line. If you don’t have a bone folder, the rounded handle of a clean butter knife may be substituted. If you don’t have a bone folder, draw the blunt blade of the butter knife down the line where you want to fold, then carefully fold over with the blunt butter knife handle. Tip: Test products you’re using on a scrap piece as you go. Tip: It can be sewn using your sewing machine, with a heavy-duty sewing machine needle, just keep in mind that all holes from pins and needles are permanent. Therefore, backstitch slightly to the side to secure stitching — don’t go back-and-forth over the same stitching line as you normally would when backstitching or you’ll create a hole. For the same reason, if you want to double stitch, avoid double stitching over the exact same line but stitch slightly to the side of the first stitching line instead. To Keep it Like Paper — Don’t Wash It — If you want to keep it stiff and flat like paper or cardstock, then don’t wash it before using Kraft-tex. It wipes clean pretty well as it’s water resistant. Unwashed, it could be used as a fine art surface (avoid creasing it then) or to make wallets, book covers, boxes, bag straps, etc. Testing it as a fine art surface, It was placed either on a huge clip board or on my magnetic board. (I have a huge magnetic board and plastic/enamel-coatef super magnets so that I can work on Kraft-tex at my standing easel). So far, no tape that I’ve used to secure it to the clipboard has ripped or otherwise damaged the Kraft-tex. Whether different tapes can leave an undesirable tackiness or residue is possibly an issue with some techniques and/or art products? If in doubt, test first. 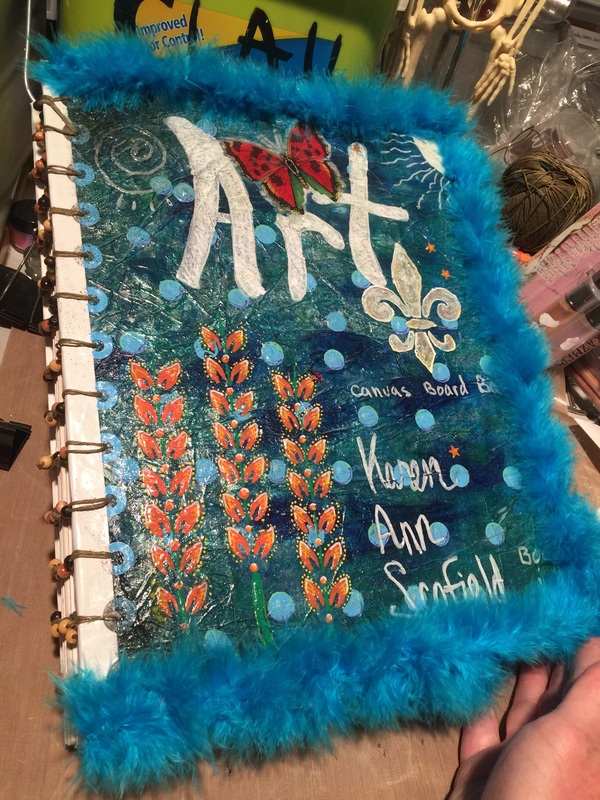 Handmade Blank Canvas Board Art Journal, by Karen. A. Scofield. Bound with a beaded coptic stitch. I covered the back MDF board cover with Kraft-tex and decorated that too. To Use it Both like Kind of Like Paper and Very Much Like a Fabric — Wash It — If you want to use it like a paper-cloth or a replacement for leather, then wash it before sewing it. If you wash it after creating your item, its resulting texture may not be as even. If you want to create a very soft fine leather-like texture, specifically, then use my method, below. This video discusses a different wash-and-crumple method than the following steps, and you can see it produced a faux leather texture that’s not as soft. A lot of people simply wash and dry their Kraft-tex on hot three times. Cut — Cut out enough for your project or cut out the pattern pieces in advance, in the first place. Container — Find a basin or cooking container that will hold your material. Remember, it’ll be kind of stiff when it first goes in to soak. Boiling Water Soak — Boil enough water, put it in your container, keeping all safety precautions in mind, and soak your Kraft-tex in that water for 5 minutes. Crumble It Up — Wearing protective, thick rubber gloves and using tongs, remove your Kraft-tex and crumble it into a ball, trying to crumble it as evenly as possible into a ball. Let it sit several minutes. Flatten — Lay it flat. Repeat — Now do steps 3 through 5 two more times — you will soak it in boiling water 5 minutes, crumple it in a ball, and lay it flat — you will do all that three times total. Dryer — As a final step, you can put it in the dryer on any setting, yes, including the hottest. In fact, some prefer the hotest dryer setting as the last step in turning Kraft-tex into a supple, sewable paper-cloth state. I’m testing an array of art products on white Kraft-tex. Paints, markers, and pens have to be truly opaque for you to see them on black Kraft-tex … unless you’re talking about irridescent Shiva Paintstiks or interference acrylic paints and powders because those can show well on black art papers and black Kraft-tex. Test even products that say they’re opaque — they may be varying degrees of opacity from brand to brand, colors may vary in opacity by nature, and some marker “juice’ may soak into substrates and dissapear some or alot while others will do fine. So test the color range or the colors you’re going to use. Also, keep in mind that washability is a consideration for some uses but not others. Some products are not washable but that may or not be a consideration for your project for various reasons. For example, if I spray a sealant on what I did and then coat it with a quality acrylic medium, it may not be a problem for the type and amount of wear my finished project might see in its lifetime. If my item is going up on a wall and isn’t going to be around outside or laid on tabletops were people might spill their drinks or other fluids, it may not be a problem that what I drew or painted on is not washable or might ruin if exposed to moisture. It all depends. Know your products and think it through before you create your items or works of art. Watercolors and Watercolor Pencils — Trying these on the white Kraft-tex, I found out they can be used wet, in dry-brushing, and in the form of watercolor pencil. One can lift colors back off of Kraft-tex and you’ll have to mind which are your staining colors, just as you would on any watercolor surface that allows lifting (removing some color). I have not tried a wide variety of wet watercolor techniques on this surface. Dry watercolor pencils, especially the lighter colors may show up on black Kraft-tex, at least my Cretacolor AquaMonoliths sure did, but test your brand first if you really want to know. Modge Podge Fabric — Works but it’s not my favorite and compared to acrylic mat mediums, it looks plasticky and can easily look gloppy if you’re not careful. Ink Jet Print It — More information being sought on that at the moment. Water-soluble Oil Pastels — I tried both Caran d’Ache Neocolor II and Cretacolor AquaStics (which are generally more lightfast). Both brands work well on this surface and, like watercolor, can be lifted off. 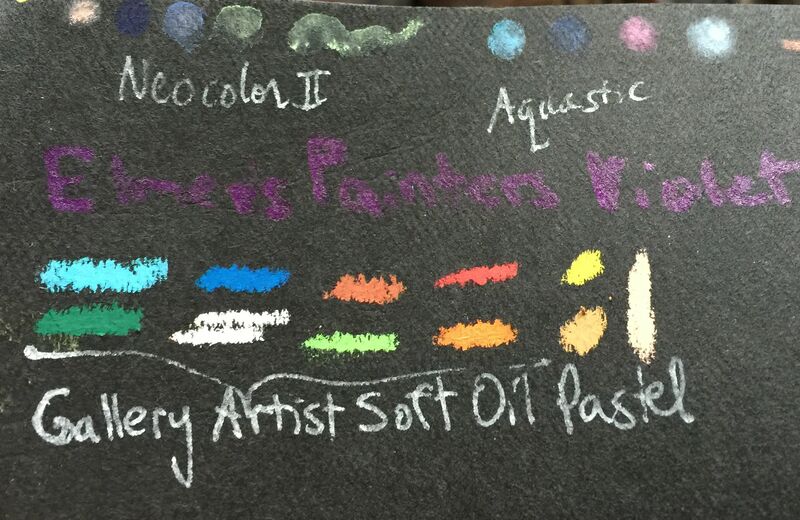 Both brands of water-soluble oil pastels have staining colors, just as artist grade watercolors do. Both can be fixed to Kraft-tex. Here’s how I did that. Apply your water-soluble oil pastels. Color, wet, blend, etc., just like you can with these products on other papers. Krylon Workable Fixative — See manufacturer’s directions and then spray with Krylon Workable Fixative and let dry. Don’t spray until you saturate the surface. Just give it a decent layer. More Fixative — Spray two more layers of Krylon Workable Fixative, letting each application dry. Let the last layer dry completely. It wouldn’t hurt to let it dry for a couple of hours or overnight. Acrylic Matte Medium — Finally, brush a light coat of acrylic mat medium over your fixed water-soluble pastels. (Liquitex Matte Medium is more matte than Golden’s, in Kraft-tex.) Let dry. Why Three Layers of Krylon Workable Fixative? — If you try to get away with only one layer of Krylon Workable Fixative, expect colors to bleed (especially some of the blues and greens in both brands). They bleed less with two layers of Krylon Workable Fixative using this method. I didn’t see any bleeding with three layers of Krylon Workable Fixative using this method. 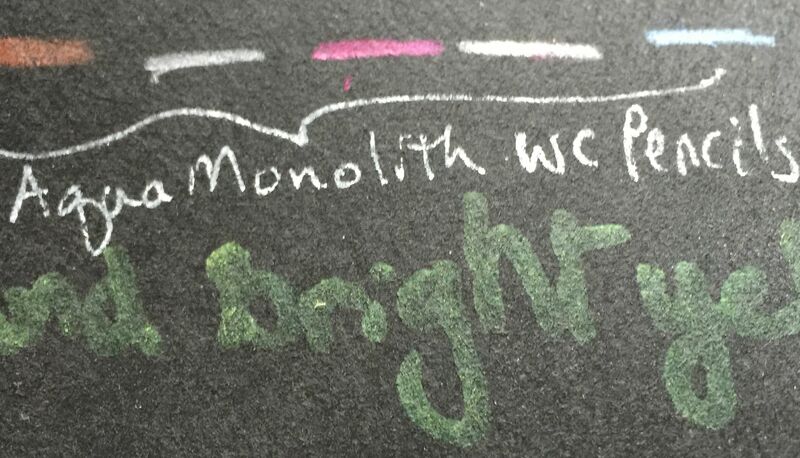 Please test whatever you’re doing with water-soluble oil pastels, however. TAP (Transfer Artist Paper) — Follow manufacturer’s directions. Before using, consider if you’ll be using Kraft-tex like a stiff paper or like a supple fabric and pre-treat it accordingly, or not. E.g., the Be Peace Bag shown here. Graphite Pencils — I tried the HB pencil from my Cretacolor set so far. These work well on white Kraft-tex, you can smudge and blend them, but they do not erase from Kraft-tex, not even if you use several erasers. I have not tried all the B pencils and I have not tried all brands. As always, test first. If you make heavy marks, you’re not going to be able to erase completely. If you make like marks and erase with a regular eraser and then also a kneadable erasure, you may be able to remove most of your pencil work. Sketching Pencils (sanguine, dark brown, black and white) — These work well on white Kraft-tex, you can smudge and blend them, but they do not erase from Kraft-tex, not even if you use several erasers. I have not tried all the brands. As always, test first. Rubber Stamps — They work well on it. Of course some ink pads are better than others, same as on other surfaces. Some are archival and water-resistant, others are very much not. Neopaque (opaque fabric paint) — Works well on different colors of Kraft-tex. Sakura Micron Archival Ink Pens — Work well on white Kraft-tex. I could not wet or scrub them off. Sakura Gelly Roll Pens — This brand of gel pen doesn’t run or bleed if they get wet, after they dry. The Moonlight ones are opaque and can be used on white or even black Kraft-tex. Rule: If your gel pens or other pens don’t say water-resistant, they probably aren’t. If they don’t say they can write on dark surfaces, they probably won’t show up well on black. 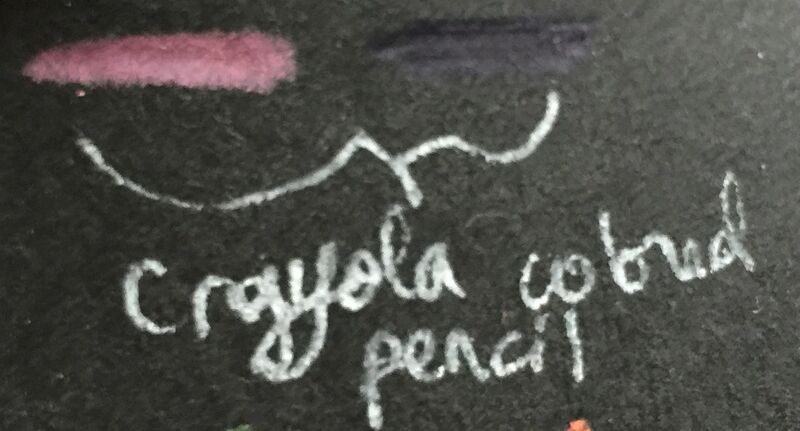 Crayola Crayons — These work particularly well on white Kraft-tex, you can get a solid coverage, and heating the crayons up on its surface is a possibility. Conte Crayons — Work well on white Kraft-tex but don’t erase from it even if you use several different types of erasers. Colored Pencils — These work very well on Kraft-tex but don’t expect them to erase. Uni-Posca Paint Pens (Markers) — These fabulously opaque water-based paint pens work very well on Kraft-tex, even black Kraft-tex but you have to work fast to blend these markers. Heat setting alone may not be enough to set them, if the item you’re making might meet up with moisture. I’ll do more testing as to how to set them on this surface and will update this page with my findings. Acrylic Paints – Acrylic paints work very well on this surface, using a variety of brushes and methods. If you’re making a wearable, use a fabric medium with your acrylic paints. Craft paints lines often have a fabric medium they sell too. Golden Acrylic Paints has GAC 900, and Liquitex also sells a fabric medium. Acrylic Inks — Same. They work very well on this surface. Alcohol Inks — Adirondack Alcohol Ink works very well on this surface but spreads so well that you shouldn’t expect to make clean, tight lines with it. They may show all the way through to the other side. A lot. Rit Dye — Works well on Kraft-tex. Pre-cut your pieces as the dye often doesn’t penetrate all the way through, though straight Rit dye did. Shiva Paintstiks — Work well on Kraft-tex and heat set. The irridescent ones work well using the rubbing technique on black Kraft-tex. Regular ones work too. Various Fabric Paints — All the brands of fabric paint and iron-on fabric crayons have worked exceedingly well on this white Kraft-tex surface. I’ll do tests to see how they take washing later. Rule: If your fabric paints or markers don’t say they work well both on light and dark surfaces, they’re probably not opaque enough to work on black Kraft-tex. Gessoes — I’m working with modern gessoes, as opposed to rabit glue gesso. Gessoes work well on Kraft-tex though one I tested, Martin F. Weber Prima Gesso, can wash out a bit while others don’t. Some gessoes are more mat than others, some provide almost paper like textures, and others can create peaks and textures. Some are even glossy looking. Know your gessoes, know your projects, know your likes, and use the best gesso for your needs and preferences. I did not find a need to use gesso on Kraft-tex. However, one could use colored gessoes or white gesso on different colors of Kraft-tex for various effects. Elmer’s Painters (paint markers) — I tested the oil-based kind. They have varying degrees of opacity but work very well on white. On black Kraft-tex, however, they were a bit of a dissapointment because they soaked right into it and seemed to seemed to dissapear somewhat, some colors more than others. They generally don’t show up well enough to my satisfaction. I have not tested them by washing. Various threads, embroidery threads, and various glues can be used on Kraft-tex. Check Glue This to That and other sites for which glues may be most appropriate for your particular project. Polymer Clays? Since Kraft-tex can tolerate heat, polymer clays cure with heat, I will experiment with polymer clay and liquid polymer clay on Kraft-tex. Wood Burning Tips — First check if that could create toxic fumes. It doesn’t sound like a very good or necessary technqiue on this material. I wouldn’t bother trying. Do the Above Products Show Through to the Other Side? After testing many products on my white Kraft-tex, I flipped it over. Only some products show through just a tiny bit, like a shadowy hint that something must be on the other side, but none of them bled through…except for two — Rit Dye and the alcohol ink. This means that I can use the other side, the yet all white side, for other work and I may or may not want to apply a layer or two of artist quality acrylic gesso to it first when I do so. Watercolor Pencils and Elmer’s Painters on black Kraft-tex. Top: Testing water-soluble oil pastels on black Kraft-tex. Middle: Testing Elmer’s Painters. Bottom: Testing Mungyo Gallery Artist Soft Oil Pastels. Colored Pencil on Black Kraft-tex. Lighter colors show better. Uni-Posca pens (AKA Posca markers) on black Kraft-tex. Very opaque. Dimensional fabric paint on black Kraft-tex. Varying opacity. Sakura Gelly Roll: Moonlight set. On black Kraft-tex. Very opaque, bold, and water resistant. Irridescent Shiva Painstik on black Kraft-tex. They show up extremely well and are heat set. Washability — Always test washability of various artwork on the Kraft-tex. The Kraft-tex itself is very washable. Printing on Kraft-tex — I will test clear Golden Digital Grounds on white Kraft-tex. I have that already and am unsure if I want to by TAP (transfer artists paper) too. Testing Opacity on Black Kraft-tex — More testing! It’s been a focus in many books, magazines, blogs and even a DVD. You can make it with many “ingredients” or few. It can be simple or amazingly beautiful and rich with colors, textures and cultural references. It can be addicting. It can be meditative. It can be useful or purely decorative. It can save you money and it can cost you money. It can be a way of getting rid of odds and ends or an excuse to go OC on collecting stuff. What Can You Make With It? Handmade Blank Canvas Board Art Journal, by Karen. A. Scofield. Bound with a beaded coptic stitch. Front cover made with handmade cloth-paper. Wallets, ATCs (artist trading cards), paint brush holders, zip pouches, tote bags, customized binder covers, book covers, corsets, handbags, slippers, hats, other wearables, customized organizers, book markers, art quilts, stuffed voodoo dolls, beads, a variety of fabric embellishments, belly dancing belts…the list goes on. It can be thicker, thinner, machine stitched, embroidered, hand beaded, glued, duct taped, fused, painted, stamped, collected, traded, and more. It’s generally tougher to sew by hand but that can be done most times. Other names for it are fabric paper, muslin paper, fabric fusion, or tissue fabric…and some people even spell it “clothpaper.” Sometimes it’s hyphenated, sometimes it’s not. Here are Beryl Taylor’s basic steps for making fabric paper: Freezer paper, muslin, glue-water, spaced paper and other bits, glue-water, craft tissue, watery paints, let dry, peel, use. She’s well known for making beautiful works out of fabric paper and has both a book and video out on it. I have them and they’re well worth it. She’s amazing. Lay a piece of washed, open-weave muslin on the waxy side of freezer paper and wet it all over with diluted PVA glue. The freezer paper or plastic should be larger than the muslin. Lay wrapping paper, images, text, etc., into the wet glue, leaving spaces in between. Apply another coat of diluted PVA glue over that. Embed craft tissue (tissue paper) into the wet glue layer. While the glue is still wet, paint on dyes using a sponge applicator. Let dry completely before cutting and stitching. This can take several hours to several days. A Few Notes on the Glues — I had questions, so many questions, and this is what I found out. Sobo — Many use Sobo fabric and paper glue, a PVA glue, because of its hand and flexibility once it’s dry…but it’s water-soluble once dry. I found mine in Joann’s for $2.99 a 4 oz. bottle. Lineco Neutral pH Adhesive — Others are using archival (won’t degrade papers over time) Lineco Neutral pH Adhesive, which is also a flexible PVA glue that’s water-soluble even after drying. Of course, using archival glues doesn’t help if all your papers aren’t archival. Most people are using what they have rather than archival tissue and other papers. Cost Comparison If bought in a gallon jug through dickblick.com, Lineco Neutral pH Adhesive presently costs the same as Sobo which does not come in gallon jug containers. Fabric Mod Podge does not come in larger containers and can end up being your most expensive option, although you can frequently use a coupon when buying it in a Michaels store. Per liquid oz, Liquitex Matte Gel acrylic medium costs the least, if I buy it off of dickblick.com. If you buy it with a 40% off coupon in a brick and mortar store, it’s about the same cost as your PVA glues. You may do your own cost comparisons, of course. Personally, I’m leaning toward using Fabric Mod Podge and/or Liquitex Matte Gel. The cat, the baby, the cup that tips over, the bottle that leaks in your purse…the humidifier that leaked all over to the table…stuff happens. Made with tissue papers, cotton fabric, water, glue, and paints. Can be sewn. This cloth-paper was used to make the cover of a coptic stitched art journal. Something You Can Peel Your Dried Paper Cloth from Once Dry— Plastic sheets, garbage bag plastic, that wide roll waxy freezer paper – use whatever you have that you can peel your dried fabric paper off of once it’s dried. You can even use washed plastic dog food bag (what I’m using). Cheesecloth – Cheesecloth can be bought in Walmart, some grocery stores, fabric stores, or online. Optional Odds and Ends — Scrap papers, brown paper bag, metallic candy wrappers, pre-washed fabrics, ribbon, flocking, rock dust, dryer lint, silk roving, dried rose petals, leaf skeletons, glitter…. just any kind of ephemera to make your layers and what makes you happy. Glue — Sobo glue, Fabric Mod Podge, Lineco Neutral pH Adhesive and/or Liquitex Matte Gel acrylic medium. Colors— Fabric paint, acrylic paint (craft or fine art paint kinds), alcohol inks (e.g. Adirondack), Dyna-Flow, etc. Many of the fluid acrylic colors are rather transparent and can be diluted with water, making them ideal. They go a long way because of their incredible pigment load and give superior results. That’s why Beryl Taylor uses Golden Fluid Acrylics in her video. Brush — Foam paintbrush or cheap craft paint brush. Foam brushes are often preferred for mashing layers without tearing them. Add Color to your matte medium or glue and water mixture — Add some color; either fabric paint or acrylic craft paint. Brush to Saturate — Using a foam brush, saturate your lightweight cotton fabric of choice with the colored glue or matte medium water mixture. Have no dry edges of areas. Add Tissue Paper(s) – Apply a whole sheet or torn strips of tissue paper onto the web fabric with the flat side of the foam brush, mashing it down. You can use either flat or scrunched up tissue paper. Use enough glue-water to flatten it down. You may color the glue water with acrylic paint if you like. The result you want is flattened and has no air bubbles. Add Cheese Cloth — Cut a whole sheet, strips or bits of cheesecloth and mash onto the top of the tissue paper too. Make sure it’s web with glue-water. You may scrunch it up a bit in areas. Added Touches — Add bits and pieces for any type of contrast you like (light and dark, contrasting colors). You can use papers, bits of yarn, thread snippings…use your imagination but they have to be totally wet with glue-water. Dry Thoroughly — Let dry for 24 hours or more. Peel. Use your fabric paper in a variety of ways. It can be layered and stitched by machine or by hand. Use the stronger sewing machine needles for thicker fabric paper – 70/80 or 90/100, respectively. You may have to replace machine needles more often when sewing fabric paper. Strong PVA glue or Liquitex Matte Gel acrylic medium, etc. Protected Surface – Whatever you use, you must be able to later peel your fabric paper off this surface without damage to the surface or your fabric paper. Tape a sheet of freezer paper or waxed paper, whatever you chose to work on, to a piece of cardboard or other board you want to work on. Place this on a level surface. Or tilt it if you’re innovating with coloring it, you dare devil you. But it’ll have to lay it flat to dry. Lay Down Used Fabric Softener Dryer Sheet. Tape it down on the waxed paper if you like. Glue-Water — Mix glue and water using a 1:1 ratio. Or mix matte gel and water using a 1:1 ratio. That’s equal parts of water and glue. The glue will be water soluble once dry and the matte gel won’t be. Pour and Spread— Pour the glue-water on the sheet in the middle and spread out until it covers the entire surface. You may mash and tap the wetness all over. Leave no area dry. Add Paper and Stuff — Layer and down decorative napkins, tissues papers, fabric, ribbon and thin papers. Use more glue-water over these. Don’t worry, it’ll dry clear and adds strength. Layers add strength; how much strength and how many layers is up to you. Color — Alcohol Inks, Glitter Sprays, Dynaflow, Acrylic Paints – Drip, brush or spray these on as you know how. You can use craft or acrylic paints. Weeeee! Layer— Keep adding, layers until you’re satisfied. Mash and press down the glued pieces, making sure they come in good contact with the layer below it. You may lay down plastic wrap and a book top of it and let it dry completely. Make sure there’s enough plastic wrap to protect both the book and fabric cloth. If do this, it’ll take longer to dry, of course. Dry— Let it dry several hours, 24 hours, or longer. It must be completely dry. Peel — Peel your dried fabric paper off of your waxed/freezer paper or other surface you were working on. Using Your Fabric Paper Use your fabric paper in a variety of ways. It can be layered and stitched by machine or by hand. It can be glued. It can be used in art journals, greeting cards, ATCs (artist trading cards), bags, totes, purses, fabric bowls, functional items, jewelry, and various types of embellishments. Use the stronger sewing machine needles for thinner and thicker fabric paper – 70/80 or 90/100, respectively. You may have to frequently replace machine when sewing fabric paper. See Maggie Grey’s “Background 3” in her book (see the resources section below). “Tissue Fabric” is covered in Fabric Art Collage, 40+ Mixed Media Techniques, by Rebekah Meier. Glue-water is used. Paper cloth is covered in Stitch Alchemy, Combining Fabric + Paper for Mixed-Media Art, by Kelli Perkins. This book has more of a focus on it. Glue-water is used. “Making Fabric from Paper” (ch 4) appears in The Quiting Arts Book, Techniques and Inspiration for Creating One-of-a-Kind Quilts, by Patricia Bolton. Yes indeed, it’s paper cloth put together with diluted glue. Beryl Taylor contrubuted. Fabric paper is covered in The Cloth Paper Scissors Book, Techniques and Inspiration for Creating Mixed-Media Art, by Barbara Delaney. Look for the “Building Upon Layers, Detailed Design Made Easy” section of Chapter 2: Printmaking and Surace Design, see pages 36 – 39. Once again, Beryl Taylor contributed. Glue-water is used. 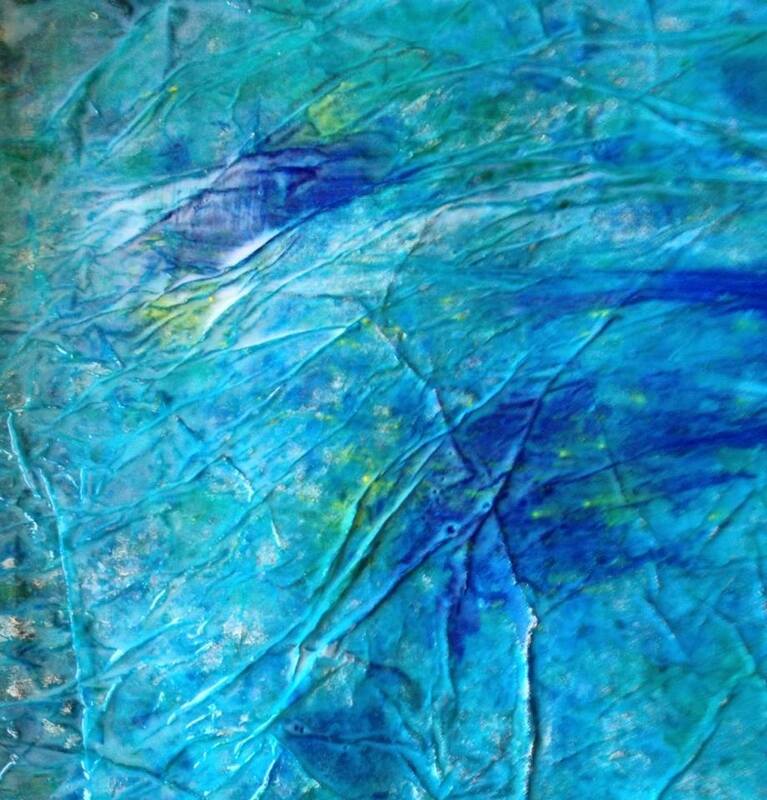 Paper cloth is covered in Mixed Media Explorations, by Beryl Taylor. Paper cloth is covered in Mixed-Media Master Class with Sherrill Kahn: 50+ Surface-Design Techniques for Fabric & Paper, by Sherrill Kahn. Glue-water is used but the “glue” is matte gel, an artist acrylic medium. Maggie Grey covers “Background 3: Brown Paper and Bondaweb (fusible webbing)” in Chapter 1: Making Backgrounds of her book Raising the Surface with Machine Embroidery. No glue-water used in that recipe either. This Canva-Paper took a lot of rough treatment, layers of paint, and barely, and I mean barely, buckled. It didn’t degrade or tear either. Here’s what I did so far. I took a 12 x 16″ sheet of this Canva-Paper, taped it down with Frogtape Delicate Surface Painter’s Tape, and put down layers of Liquitex Basics acrylic paint (one of the best student grade acrylics paints out there), rubbed some off, laid down textures within the paint with the lovely Princeton Catalyst Blades (silicone blades are fun! ), put down more layers of acrylic paint, rubbed off paint here and there, and added more layers of paint. I finally added some Liquitex Clear Gesso (which is kind of gritty) and then sanded the surface. And all of that on paper. Wow. …Later, I did even more to this paper and it still stood up to all the treatments I did (more layers, more wiping, more sanding). I should have started working on this paper instead of trying to use cheap student canvas (paper) boards! I’m going to try using Cretacolor leads on this in “aux quatre crayons” (white, black, brown, earthy red) or “aux trois crayons” (using just three of those colors) sketching style. I can do this with confidence because the buckling was so minimal. I got my Canva-Paper pads at our local Michael’s craft store during a two-for-one sale, very happy with it, but wish they sold 18 x 24″ pads there. Side Note: I hyperlink to dickblick.com product pages simply because they offer some of the best information on and classification of products (artist grade vs. student grade, oil based or water based) I’ve seen, plus you get to read reviews and maybe even see how people used the products…or weren’t able to. I’m not affiliated with dickblick.com in any way at this time.